Jeans for Genes Day - Friday 21st September - Fundraising Coffee Morning in Aid of Genetic Disorders UK Judith Taylor, President of the Inner Wheel Club of Newent & District, District 10 GB&I ! in 25 babies born will have a genetic disorder. some may hardly be noticeable, others can be extremely disabling and life limiting. My own daughter, Imogen, was born at 29 weeks, weighing 800grams and didn’t thrive. Her growth was incredibly slow and at 9 moths old she was diagnosed with a rare genetic disorder called Russell Silver Syndrome. Genetic Disorders UK was my obvious choice of charity to support during my yeat as President of the Inner Wheel club of Newent & District. Early in 2018, well before I took up the reins, I approached Newent Community School (11-18years) to ask if they would support “Jeans for Genes” day on 21st September. To my delight they agreed to jeans, in exchange for £1, but encouraged me to hold sommething at the school. It was discussed with our club members and we decided a coffee morning would be good idea, promoting it through our Inner Wheel District 10 Clubs and the local community. The school truly entered into the spirit of the event and I had such a positive meeting with the head of music and the catering manager and came away with the promise of mIn usicians to play throughout and a special cake with the logos of Inner Wheel, the School and Jeans for Genes Day. It all evolved from that early meeting and culminated in a wonderful occasion In addition to the day I was asked to do 3 morning assemblies for the 3 houses that make up the school on the 3 days leading up to Sept. 21st. This was to explain more about Genetic Disorders UK, and also very clearly promoted Inner Wheel. 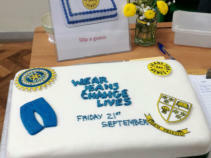 Our Inner Wheel ladies made lots of delicious cakes, as did the school and also cakes were donated by a local lady, Wendy Lewis, who also ran a tombola on the We had a “bring & buy” table and with the money from the school from students wearing jeans and paying £1, the total raised was £1,400. In recognition of “International Day of Peace” and, at the request of our Association President, Ann Acaster, we planted a “Peace Rose” in the grounds of the School, ably assisted by the Mayor Newent, June Davies.